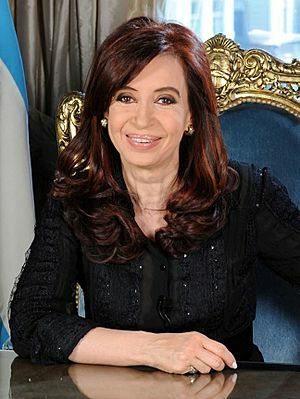 Cristina Elisabet Fernández de Kirchner (February 19, 1953), also called Cristina Fernández or Cristina Kirchner, is an Argentine attorney and politician. She was the President of Argentina from 2007 to 2015. She was born in La Plata, Buenos Aires Province. She is the daughter of Eduardo Fernandez ( of Spanish descent) a bus driver, and Ofelia Esther Wilhelm (of German descent). She is a lawyer and she was married to former Argentinian president Néstor Kirchner from 1975 until his death in 2010. She was elected President in October 2007. She was re-elected to a second term in October 2011. Campaigning with her husband, then-President Néstor Kirchner (outgoing), and their respective running mates, Daniel Scioli and Julio Cobos. Cristina Fernández de Kirchner with the minister of economy Axel Kicillof. President Cristina Fernández de Kirchner announces the bill to renationalize YPF. 200,000 people took part in a cacerolazo against Kirchner. A financial firm located at the Madero Center hotel sparked The Route of the K-Money scandal. Cristina Kirchner with the Mothers and Grandmothers of the Plaza de Mayo. President Kirchner after the defeat at the 2009 midterm elections. Cristina Kirchner among the presidents of the Union of South American Nations. Cristina Fernández de Kirchner Facts for Kids. Kiddle Encyclopedia.